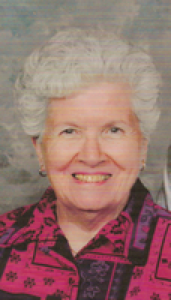 Eva Mae Lamming, 81, 8460 Patterson-Halpin Rd., Sidney, Ohio died at Covington Care Center, Covington, Ohio on Thursday, August 13, 2009 at 12:56 PM. She was born November 8, 1927 in East St. Louis, Illinois the daughter of Walter and Eleanora (Coates) Brown and they are deceased. She moved to Shelby County in 1988 from Belleville, Illinois. She was married on February 12, 1965 to Wayne Lamming and he survives along with two sons, Kenneth Niederbrach and wife Connie of Russia, Ohio and Michael Lamming and wife Pat of Afton, Missouri; five grandchildren and six great-grandchildren and one brother, Walter Brown of St. Louis, Missouri. One daughter, Linda Langston and one brother, William Brown are deceased. She was a member of the Sidney-Shelby County Senior Citizens, volunteer at Agape Distribution for three years and volunteer at Dorothy Love Retirement Community for eight years. She was a member of the New Hope United Methodist Church in Sidney. She had been a bookkeeper at the St. Louis Post Credit Union at one time. Funeral services will be held on Thursday, August 20, 2009 at 11:00 AM at the Kurrus Funeral Home, 657 North 57th St., Belleville, Illinois. Friends may call at the funeral home on Wednesday, August 19, 2009 from 4-7 PM. Burial will be at Valhalla Cemetery, Belleville, Illinois. Memorial contributions may be made to Agape Distribution, P.O. 808, Sidney, Ohio 45365. Memorial services will be held locally at a later date at the New Hope United Methodist Church in Sidney.